Bay Area Legal Aid (BayLegal) seeks dynamic law students with a strong commitment to public interest and social justice advocacy to help provide comprehensive legal services to the poor. BayLegal selects approximately 20-30 law students to work in our offices during the school year and approximately 40 students during the summer. Under the supervision of BayLegal staff attorneys, clerks will have the opportunity to build cases from the ground-up, including: conducting client interviews and initial case assessments; obtaining discovery and other evidence; preparing clients for trials; writing briefs and other legal memoranda; assisting self-represented litigants; participating in community outreach and education; and representing clients at administrative hearings and state court hearings/trials. Law clerks may also assist in drafting writs of mandamus to Superior Court and California appellate courts, and participating in broader impact litigation. Law clerks often work on projects and cases that have a wide-ranging and lasting impact on our client communities. Consumer Protection Advocacy (This unit is based in San Francisco and serves clients throughout the Bay Area): Law clerks provide assistance with economic and financial problems affecting low-income consumers including foreclosure prevention, bankruptcy, student loans, fair debt collection, unfair businesses practices, and consumer scams. The consumer protection unit protects the rights of clients living in poverty who are particularly vulnerable to high-cost credit, predatory loans, credit reporting errors, problems with employment and housing background reports, predatory for-profit schools, and unfair business models such as credit repair organizations and foreclosure rescue scams. Law clerks assist with client interviews and learn to issue spot legal problems, draft legal pleadings, and conduct legal research and writing. Certified law students are encouraged to appear in court. Consumer Rights Clinics (Napa, Alameda, Contra Costa, San Mateo, Santa Clara): Consumer Rights Clinics provide know-your-rights workshops and one-on-one assistance in the communities where low-income consumers reside. Law clerks assist clinic attendees with consumer law problems with a focus on debt collection lawsuits and protecting exempt income and wages from collection activity. Substantive training for clinic volunteers is provided two times per year; however, applications are accepted year-round. Economic Justice Advocacy (Alameda, Marin, Napa, San Francisco, Santa Clara): Law clerks assist clients in obtaining desperately needed health coverage as well as welfare and disability benefits. Law clerks participate in direct individual representation and ongoing impact litigation. Law clerks learn about Medi-Cal, Medicare, Healthy Families, CalWORKs, General Assistance, Food Stamps, Supplemental Security Income (SSI), Social Security Disability Insurance (SSDI) and general health access issues. For SSI and SSDI clients (benefits for low-income individuals who are unable to maintain employment due to physical and or mental impairment), law clerks have the opportunity to identify eligibility, gather and build evidence, prepare briefs, assist with negotiations and possibly represent the client in an administrative hearing. Family Law Advocacy for Domestic Violence Survivors (Alameda, Contra Costa, San Francisco, San Mateo, Santa Clara, San Mateo): Law clerks participate in BayLegal’s comprehensive family law legal representation to low-income survivors of domestic violence by providing litigation assistance in a full range of family law matters including divorce; child custody and visitation; child and spousal support; and restraining orders. Domestic Violence Restraining Order Clinic (Contra Costa, San Mateo) Law clerks assist self-represented litigants seeking civil domestic violence restraining order protection (including child custody, visitation and support orders). Clerks have the opportunity to become familiar with all stages of the process and work directly with litigants conducting interviews and drafting pleadings. Health Access Advocacy (Alameda, Contra Costa, Marin, Sonoma, Napa, San Francisco, Santa Clara): Law clerks have the opportunity to assist providing advice, negotiating with agencies and organizations which provide health services and representing BayLegal clients in state administrative hearings (no certification necessary) on a variety of legal issues related to obtaining health care services, including the Affordable Care Act (“Obamacare”). Housing Preservation Advocacy (Alameda, Contra Costa, San Francisco, Santa Clara): Law clerks work on homelessness prevention, housing discrimination issues using Fair Housing laws to file administrative complaints (HUD & DFEH), preservation of affordable housing and fighting illegal evictions. Clerks interview clients, prepare legal pleadings and assist with a full civil litigation case during a short amount of time (including possible jury trial). Immigration Advocacy for Domestic Violence & Sexual Assault Survivors (Alameda, Contra Costa, San Francisco, San Mateo, Santa Clara): As a part of BayLegal’s comprehensive legal services to low-income immigrant survivors of domestic violence and sexual assault, law clerks have the opportunity to assist with VAWA Self-Petitions and U Visa Non-Immigrant Petitions. These immigration remedies provide relief for survivors who are either immediate family members of abusive U.S. Citizens or Legal Permanent Residents, or who cooperate with the investigation and/or prosecution of the crimes perpetrated against them. Law clerks learn how to assess eligibility, prepare immigration pleadings and work directly with immigrant survivors. Legal Barriers to Employment Project (LBEP) (San Francisco): Law clerks help eliminate legal barriers to employment, such as criminal records, suspended drivers licenses, threatened evictions, and credit problems, using a full range of legal remedies. LBEP provides comprehensive legal services to individuals on welfare who face legal barriers preventing them from gaining employment and escaping poverty. 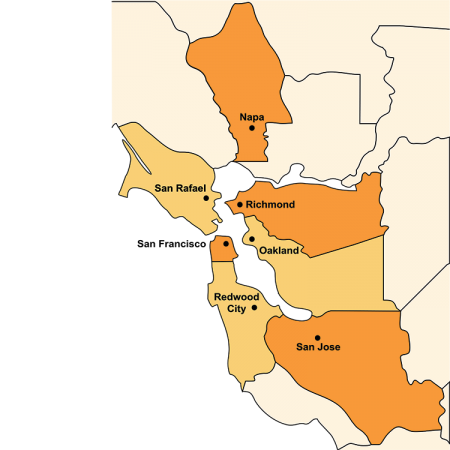 Reentry Advocacy (Alameda, Contra Costa, Santa Clara): Low-income individuals seeking to overcome a criminal conviction and reestablish themselves within our communities face multiple civil barriers including in housing, employment, licensing, access to public benefits, and consumer debt. Law clerks help to provide wrap-around legal services for these clients by assisting with direct representation in a wide array of civil legal practice areas. Law clerks also participate in on-going impact litigation. Medical Legal Partnership (MLP) (San Francisco, Contra Costa) Law clerks will be able to assist in providing wrap-around support for clients whose legal issues are affecting their health, while learning about the Medical-Legal Partnership model of addressing social determinants of health. Medical-Legal Partnerships are growing across the United States, and allow attorneys to work with clients across multiple areas of law. Law clerks have the opportunity to meet with families on-site at San Francisco General Hospital to help identify legal needs and provide assistance (from advice/counsel to representation) in a number of legal areas, including housing, special education, and public benefits. The Contra Costa County Medical-Legal Partnership partners with Contra Costa Health Services, and allows public health nurses and social workers to refer their patients to Bay Area Legal Aid. This particular Medical-Legal Partnership mainly receives referrals related to Housing and Social Security, although there are opportunities to represent clients in other areas of law as well. Youth Justice Project (YJP) (Alameda, Santa Clara): Law clerks support YJP, an innovative project providing comprehensive advocacy to poor youth with disabilities and mental health needs, by participating in a wide range of legal representation and assistance to ensure access to essential public benefits, special education, housing, and health care services. YJP focuses on children in, previously in, or at risk of foster care or delinquency who have been denied or not informed about important benefits and services for which they are entitled. Applicants should have completed their first year of law school. The successful applicant must possess a passion for social justice and poverty related issues, as well as sensitivity to working with people from diverse backgrounds. Special consideration will be given to students who have a demonstrated commitment to serving low income or disadvantaged communities. BayLegal encourages students who have completed the required Evidence Course to become certified by the California State Bar to represent clients in court. During the school year, students commonly work 10-15 hours per week. During the summer, law clerks work on a full-time basis. Students who speak Spanish, Cantonese, Vietnamese, Russian, or other Southeast Asian languages are encouraged to apply. BayLegal welcomes and gives preference to students who can commit to more than one semester. Students are encouraged to apply for funding through their law school and other grant opportunities (please contact us if we can be of assistance). See https://www.psjd.org/ for more information. Law clerkships are available throughout the year and applications are accepted on an ongoing basis year-round until all positions are filled. For Summer, we start reviewing applications in October on a rolling basis, and we recommend applying before February 1. Please submit a completed BayLegal Law Clerk Application (available BayLegal.org) indicating preferred office(s) and project(s) with a copy of your resume, cover letter and writing sample to: probono@BayLegal.org. Questions: Email Andrea Del-Pan, Esq., Pro Bono Director – probono@BayLegal.org.